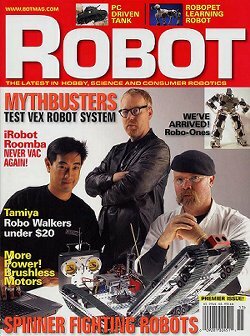 Ridgefield, CT, August 15â€”Tom Atwood, Editor-in-Chief of Robot magazine, will present the August 16 keynote address to the Robotics Educators Conference sponsored by the Carnegie Mellon University Robotics Academy in Pittsburgh, Pennsylvania. The address, â€œGrowing an Industry: A National Priority,â€? will give conference participants an overview of the current state of robotics research and development in the United States and worldwide and outline the critical role of educators in preparing students to meet the needs of this critical national industry in the coming years. â€œI am looking forward to addressing the Robotics Educators Conference on this important topic,â€? said Tom Atwood. â€œRobotics researchers in the United States make significant contributions to private industry, national defense and scientific exploration, placing the U.S. in a strong position with regard to the rest of the world in the strategic use of robotics technologies. In all of these areas, our continuing ability to identify and meet the technological challenges will play a key role in determining our national future. […]â€? â€œFor Robot magazine,â€? continued Atwood, â€œThe educational robotics community is an important component of our readership and the opportunity to be involved at this level with educators is very exciting. Robot is committed to continuing to support this important group to help them achieve their goal of creating the human resources necessary to advance our future in robotics.â€?